First created in 1999 by the Fourth Gate Master Cylinder in Tahiti. Newly created at each Master Cylinder through 8 Gate 2 in Lake Titicaca, Peru / Bolivia. 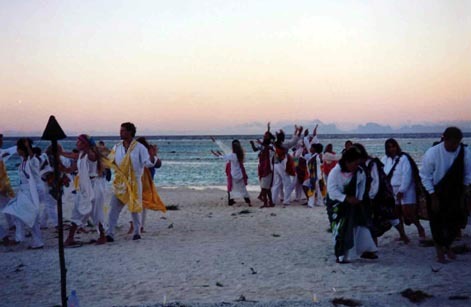 During the Fourth Gate Activation in 1999, the Master Cylinder and each 11:11 Anchor Group was asked to create a Dance of the Elements. A Dance of the Elements has then been performed at every 11:11 Gate Activation until 8th Gate 2, where this dance reached its culmination point. 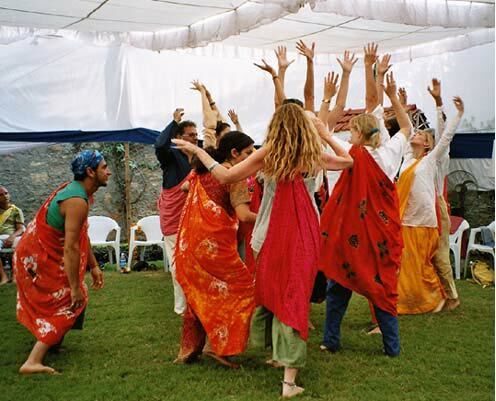 Each time, the dance has been totally recreated and moved to a new level. At the Eighth Gate 1 Master Cylinder Dragons of the Elements were added to the Dance and at the second Eighth Gate Activation, the White Dragon was born. 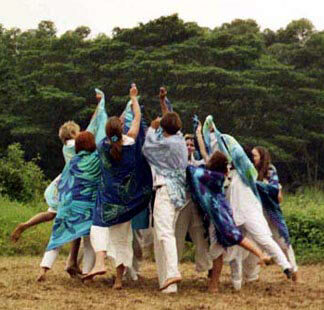 Each 11:11 Anchor Group can also create their own, unique Dance of the Elements. 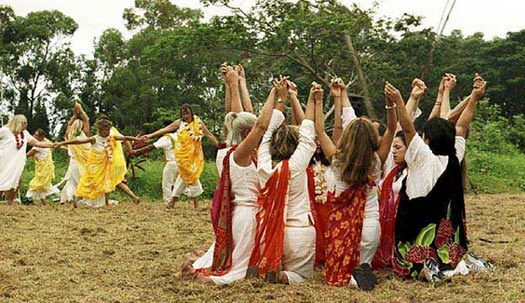 It is preferable if this dance is created by the entire group rather than a few individuals. It’s best that this is done in your pre-Activation meetings rather than at the Activation itself. Dance of the Elements at the 6th Gate Activation in Ireland. The Dance of the Elements is an extremely grounded dance that reconnects us on a cellular level with all of life. This dance is a way of communicating to the whole planet what is taking place in terms of the quantum new energies entering the planet during the 11:11 Activations. It aligns us, all of nature and everything else that exists into One Vast Unified Being on the level of pure core energy. The Dance of the Elements reconfigures and quickens the molecular structure of all lifeforms to be lifted by and aligned with the new matrix of PURE HEART LOVE. Above: Air and Fire Elements at the Fifth Gate Activation in Hawaii. Below: Water Element at Fifth Gate. Ask for someone to choose to be the Earth Element and have them stand in a corner of the room designated as the Earth area. Then have someone choose to be Air and stand in the Air corner. Then a Water person, and a Fire Element. Each Element should go stand in a different corner of the room. Keep going through the Elements: Earth, Air, Water & Fire, until everyone, except for a few Guardians, belong to one of the Elements. 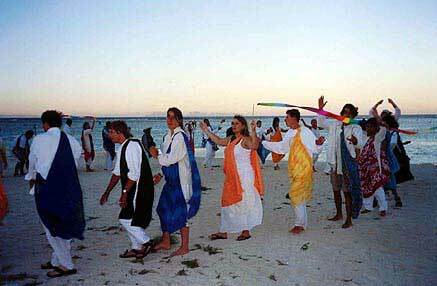 Once the Elements are together in their groups, it’s time to bring out the sarongs, pareos, scarves & colored cloth that people have brought in various colors. Tie the corners of the sarongs diagonally over your shoulders so the cloth hangs down. See photos of the Dance of the Elements at Fifth Gate. The Fire Elements will be wearing reds, oranges or magentas. The Water Elements will be wearing blues. The Earth Elements will be wearing greens and browns. The Air Elements will be wearing yellows and white. At the Sixth Gate Anchor Group in Wales, they did a wonderful thing for this dance. The children made masks and costumes for the Sun, Moon and Elements. Here are a few photos! Above: Earth Element at the Fifth Gate Activation in Hawaii. Below: Fire Element practice at Seventh Gate in India. Each of the Element groups should now focus on their element, feeling the best way to embody the core essence of their element. Once everyone has aligned with their element, it’s time to create their special dance. These movements should be fairly simple and repetitive, moving in a circular pattern. They can also include singing or chanting. Once the dances are created, everyone can sit down and watch as each Element group performs their dance in front of the others. These new dances are very impressive and beautiful. Next, as a group you need to create the grand finale of the Element Dance. 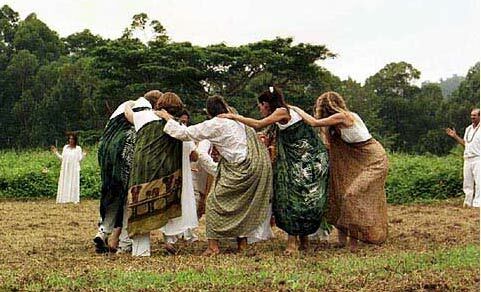 After all the Elements have completed their individual dances, (performing them simultaneously at the Activation Ceremony, rather than in individual groups during practices), they merge together as One. As an example, it could be something like all the groups simultaneously doing their individual dances as parts of a larger mandala. Then the mandala might change, forming circles within circles. Then the outer circles might dance into the center. 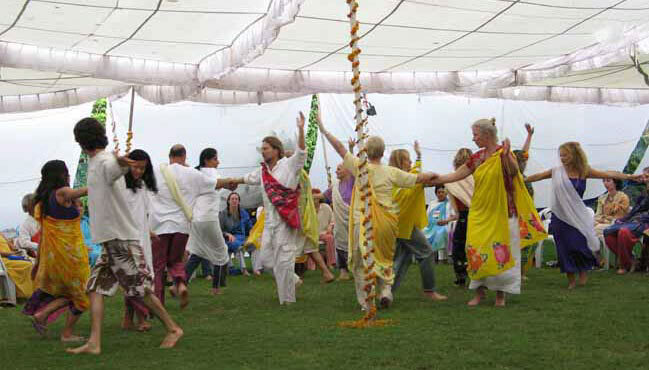 And as they reach the inner core, they remove their sarongs, until all the dancers have placed their brightly colored sarongs in the center and are clothed in white, becoming One Being. Above: Air, Fire and Earth Element at the Fourth Gate Activation in Tahiti. Below: The Elements merge at Fourth Gate.